In a recently released market intelligence, Fact.Mr analyzes multiple factors associated with the performance of RF power amplifier market in Asia Pacific. Influenced by massive development in industrial sector, telecom, and wireless networks, Asia Pacific accounts for nearly 40% of the total revenue of RF power amplifier market. Increasing penetration of smart phones and related devices coupled with expansion of 5G cellular networks is anticipated to promote growth of RF power amplifier market in the Asia Pacific region. Incessant rise of consumers of electronic sector in developing countries has further attributed to the growth of this market. According to the Fact.MR’s study, the RF power amplifier market in Asia Pacific is catalyzed by advancements in semiconductor industry coupled with rising demand for energy-efficient products. With IoT and next-gen wireless network taking over the technological world, the RF power amplifier market is expected to witness a rampant growth in the near future. Presence of prominent semiconductor industry in emerging economies of Asia Pacific such as China, Japan, and India is likely to bode well with the growth of RF power amplifier market. Further, increasing investment into the development of technologically advanced RF power amplifier has been envisaged to create lucrative dimensions for manufacturers across Asia Pacific. 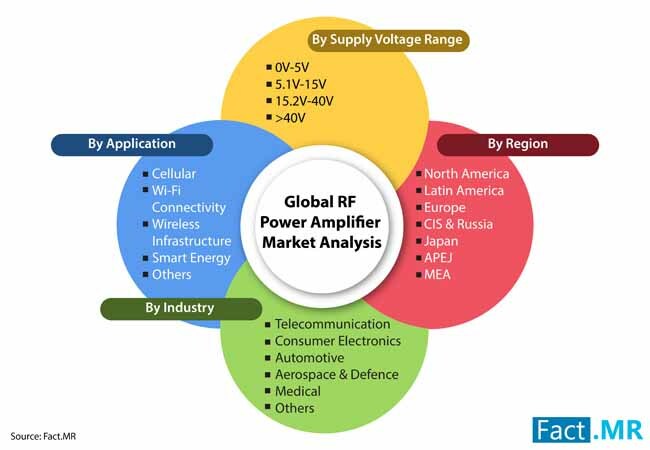 As mentioned in the Fact.MR report, the RF power amplifier market in Asia Pacific excluding Japan has been estimated to be valued over US$ 1,200Mn in 2018, expanding at robust CAGR of 13.2%. China remains in the forefront of the market, exhibiting a relatively high CAGR over the period of assessment from 2018-2028. India and ASEAN countries are further likely to contribute to the growth of Asia Pacific RF power amplifier market. By application, the market is foreseen to remain consolidated in cellular segment, accounting for 40% value share by the end of the forecast period. The global outlook of RF power amplifier market is will possibly be as optimistic as its regional market. The Fact.MR forecasts the global RF power amplifier market to surpass a value of US$ 3Bn in 2018 in terms of revenue. Growth in mobile-to-mobile communication is anticipated to fuel the progress of global market. While Asia Pacific continues to maintain its supremacy, the global RF power amplifier market is expected to expand significantly in developed nations of North America and Europe. Industry expert foresees the deployment of 5G network in wireless products and connected devices to escalate the demand for RF power amplifier across the globe. However, the growth of RF power amplifier market is likely to remain sluggish in various countries of Latin America and Middle East & Africa, due to the less development of technology. Lesser priority on the R&D of such products in these regions will further create hindrance in the growth of global market. High tariffs imposed on the import of consumer electronic goods by various nations is also expected to imbalance the presence of RF power amplifier market. Further, the Fact.MR report offers profiles, business strategies, new development, and regional operation of leading market players.